Last night, I put my bow case down in the middle of the patio, put a rock on it to keep it from blowing away. I put dish soap and laundry soap on it. Then the storm came. This morning, the case doesn’t smell like cat piss anymore. It’s probably the best smelling bow case in the world. Now it’s just got to dry off. I wonder if I could’ve saved my three couches this way. 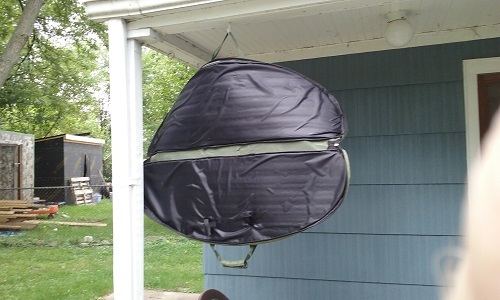 So, why is my bow case hanging outside? Buddy here thought it would be a wonderful idea to relieve his bladder all over it. He destroyed three of my couches this way. I have doubts that the smell will ever come out of the bow case, and I’ll probably have to throw it out. I like this case. No, Buddy will not be murdered, nor will he be given away or dropped off. Yes, I am furious with him. Yes, I lost my temper and yelled at him multiple times, and scared him. I feel bad about that, but this pisses me off. It’s like I can’t have anything soft in my house. I’ve been keeping him out of the bedroom during the day, because I’m afraid he’ll piss on the bed when I’m not there. I haven’t had a couch in over a year. I’m not going to get another couch until I have a protective cover for it. 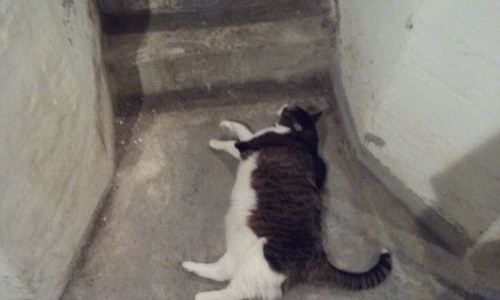 Yes, his litter box is fine and he uses it. Yesterday, my dad and I were at Menards in Davison. When we on our way back to the car, we stopped and looked at a couple of towering quadpod stands. I expressed that I was interested in them and had been looking at such things online for a couple weeks now. (Remember, I’ve been obsessing over hunting gear.) But these stands are out of my price range, so I didn’t expected I’d have one anytime soon. My dad informed me a little while ago that him and my mom had decided to get me an early Christmas present, which happens to be the Pinnacle 14ft Quadpod. That’s quite a surprise. 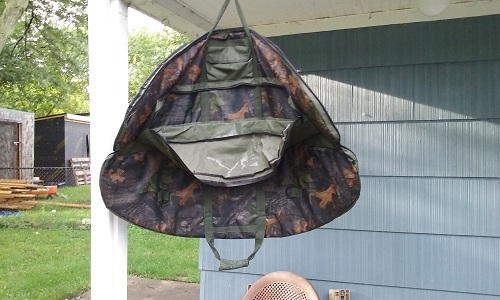 It’s an early Christmas present so I can have it up and ready in time for the bow season, which starts October 1st. I don’t have it yet, but it was ordered. I’m thrilled and can’t wait to use it. It’ll have me up much higher than my shack does. That should help keep my scent from being detected and give me a longer view. There’ll be pictures when I have it and it’s set up. 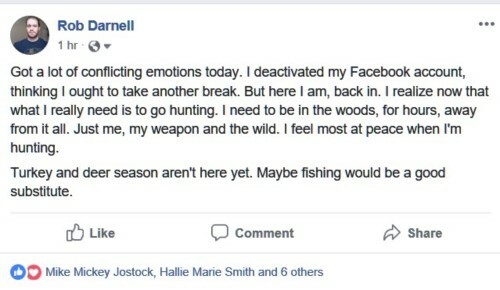 I’m aching to hunt. I’m messing around with my bow and obsessing over gear on Cabelas.com. Want to get over to my mom and dad’s and check out my hunting ground, but doesn’t look like that’s going to happen today. If you can write a good hunting or fishing story, fiction or nonfiction, Gray’s Sporting Journal will pay $600 to $1,250 if they want to publish it. I haven’t been turkey hunting yet, but today I got the blind up. 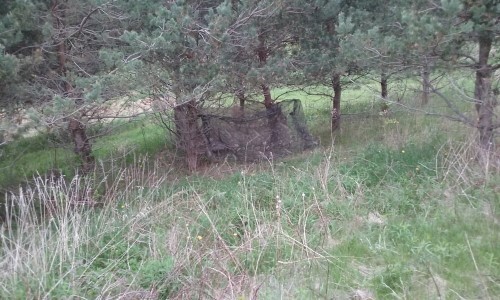 I decided to set up base in the Pine Tree Corridor, way across the field from the Bat Shack and my hunting ground. From inside the blind, I would have a nice wide view of the hill. Other news. 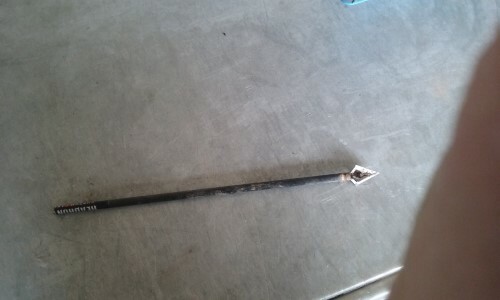 Recently my dad was on my hunting ground, where the Bat Shack is, and he found this broken arrow. He showed it to me today and I confirmed that it is the arrow that killed Deer #2. It’s a four-blade broadhead. I remember that it went through the deer and got stuck in the ground behind it. That was October 2016. I’m getting anxious for deer season.